This dog and cat Father's Day card is perfect for the pet lover, pet owner or cat and dog dad on your list. This card can be fully customized and personalized at no extra charge and also includes a free matching colored envelope, round envelope seal, and a U.S. Forever postage stamp. 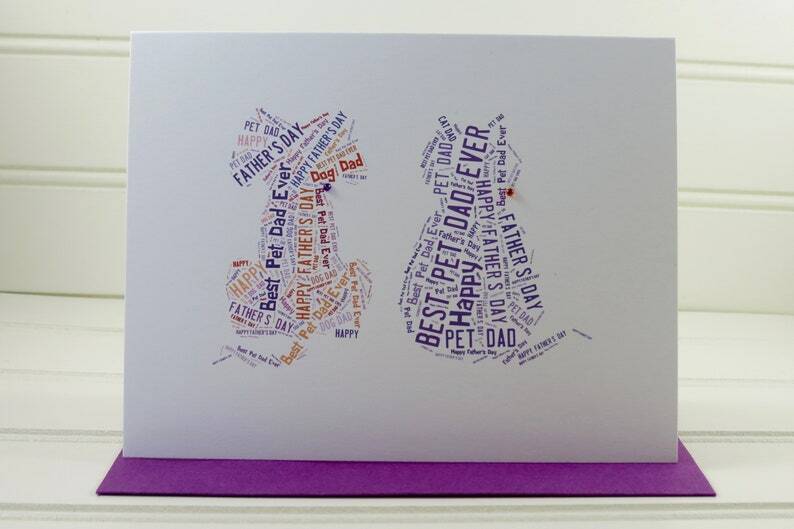 This personalized Father's Day card has an illustration with the messages, "Happy Father's Day" and "Best Pet Dad Ever" displayed as word art in the shapes of a cute cat and dapper dog. The greeting card is blank on the inside and measures 4.25” x 5.5”. Your handcrafted, Father's Day card from the pets will be individually printed in my home studio so you can further personalize it by adding any name you wish on the back of the card as shown on the photo. Provide the name(s) you want printed in the Notes section. This is so very special - the artist made it just to match our pet family! I've enjoyed working with many Etsy artists but, truly, Vikki was one of the kindest and most obliging yet. She was very quick with her work and was truly interesting in giving me what I wanted. I often can visualize what I'd like but do not have the talent to create it. Fortunately for me, Vikki does! The card arrived very quickly and was very well packaged!